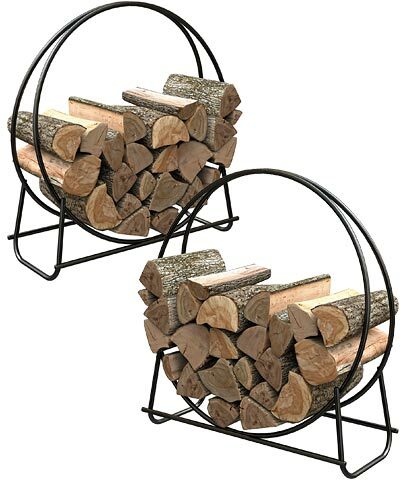 Store plenty of firewood in a fun, contemporary way with these Panacea Black Tubular Steel Log Loops. The circular body of each unit lends a modern hint to your backyard, while providing excellent storage for a bevy of logs. Durable, 0.75" diameter steel tubes form each rack, and the 39" diameter loops are great for keeping several logs off of the ground. Each item sports a black, powder coated finish to protect it from exposure to the elements, and the rectangular bottom of each piece allows it to rest on a level surface. For extra storage and a cohesive feel, place one loop outdoors and another next to your fire, ensuring wood remains easily accessible. Mix modern shape with timeless color and function in your home or outdoors using these Black Tubular Steel Log Loops. Assembly required. Note: This case pack includes 2 of the Panacea Tubular Steel Log Loops, Black.